It is reasonable to assume that most people are not interested in the details of the Catastrophic Anthropogenic Global Warming (CAGW) debate. Quite right, too. New assertions come along every day and drilling down into them takes more time than most people are prepared to invest. They have lives to lead, jobs to work, children to raise. Only whisper it: not everyone is equipped with the scientific background and the Jesuitical skills of analysis to participate effectively in this debate. Why should they need these skills? They are citizens in a democracy, not members of the mandarin class, of whom we already have quite enough, thank you. The word 'catastrophic' in CAGW is a clue to the success of the propaganda of its supporters with the media. In contrast, a story about 'nothing out of the ordinary' whether for temperatures, rainfall, glaciers or any of the other usual suspects will never get published. The consequence, of course, is that the people who remain passive and don't make the effort to keep up with both sides of the CAGW debate just receive a one-sided barrage of alarmism. Propaganda? Yes, the language used by CAGW proponents is carefully crafted for effect, as carefully as any language at any time in history. We note the preference for the vague and deliberately confusing expression 'climate change' instead of 'global warming'; we hear of 'carbon' when carbon dioxide is meant, which is as nonsensical as talking of the fiery 'sodium' or the poisonous 'chlorine' when referring to table salt; in discussions of the warming effects of carbon dioxide, the subject suddenly changes to 'greenhouse gases', a term which includes that warming demon water vapour; 'decarbonising the economy' sounds like such an obviously good thing to do, getting rid of the horrible black stuff from the environment; Reducing the 'carbon footprint', ditto; developing 'clean technologies', 'sustainable' energy production, ditto, ditto. It is interesting that the alarmists no longer talk about temperature trends, since for about the last 20 years they have been inconveniently flat, so instead we are barraged almost every day with 'hottest', 'coldest', 'wettest', 'dryest' records for weeks, months, seasons and years: something unusual can always be found, even if it takes a calculation to three decimal places to find it. The impression is created that the authorities are watching this thing 'climate' very carefully because it is so dangerous: they are monitoring the detectable twitches of the monster that will kill us all unless we change our filthy ways. The people who do drill down into these assertions are easily typified as obsessives, because that's what they are. That's what they have to be to do what they do. But just because they have certain interests and time and motivation to follow those interests wherever they may lead do not make the psychotic or mentally defective. We moderns are still in the debt of those Victorian vicars in country parishes, the majority of whose parishioners had fled to the towns and cities where the work was, who spent their copious free time compiling works of botany or immense concordances of the complete works of Wordsworth or Shakespeare. They did something useful with their time, just as the climate sceptics are doing nowadays. Admittedly, there are certainly people in the world who are so contrarian that they automatically and bitterly doubt anything any institution says or any received wisdom they come across. There has been a concerted effort to smear (the right word in the context) anyone with a sceptical opinion about CAGW as a contrarian of the first order, someone who is almost always an oddity, someone who consistently rejects 'official' accounts in favour of alternative explanations of human evolution, the assassination of President Kennedy, the Moon landings, the 9/11 attacks and even 'science' generally. It is amusing though annoying that CAGW sceptics, who spend their spare time digging around in scientific literature, are so frequently accused of being 'anti-science'. These smears are absurd and reminiscent of the equally absurd attempt by left-leaning sociologists in the 1950s to identify an 'authoritarian personality' that was characteristic for those on the 'right-wing'. 'Seek and ye shall find' indeed: they sought their interviewees in the penitentiaries of the USA and found a grand selection of 'interesting' people – people you certainly wouldn't want to be left alone with. Never mind: despite all its flaws the research on the 'authoritarian personality' still spooks around in many people's heads even today. The modern smear label is 'climate change denier', which implies an insane opposition to something that is self-evidently true and by further implication the climate equivalent of a 'holocaust denier', that is, someone who is not just stupid or deranged but morally reprehensible. In terms of battling respectable orthodoxies the CAGW sceptic has a mountain to climb. A brief list of CAGW propagandists would include: the principal meterological agencies around the world, NASA, a large number of climate science departments in universities, the Royal Society and a number of other scientific associations such as the American Institute of Physics and the American Geophysical Union, international governmental organizations such the IPCC, a number of scientific journals, in particular Nature as well as popular science journals such as New Scientist and Scientific American. Oh, and most governments in the Western world. The heavyweight reputation of these institutions attracts a number of peripheral organizations such as broadcasters and NGOs. All these scientific institutions come with substantial reputations: NASA, the organization that put a man on the Moon; The Royal Society, in there at the beginning of the scientific revolution; Nature, the most prestigious scientific journal. You deniers must be nuts – these eminent organizations can't all be wrong, can they? The explanation for their astonishing unity of opinion is that they are not independent sources of information. They all feed off each other. At the core of all this accreted respectability is a relatively small amount of scientific research. This research is recycled and amplified by these organizations, the information is decorated, massaged and frequently presented in extremely misleading ways, because most of these peripheral organizations have become funding junkies. This core is indeed a very small amount of scientific research, because a lot of the research into CAGW is not research into CAGW itself, but research into the consequences of CAGW that starts with an assumption such as 'when' – it's always 'when', never 'if' – 'global temperatures rise by x°C, y will occur', 'y' being dead coral, dead polar bears, dead alpine plants, acid oceans, immense rises in sea-level, hurricanes, wildfires, the flight of populations etc. etc., all culminating in war, famine, pestilence and death of Biblical proportions. The feeling can barely be avoided that witnessing the Four Horsemen of the Apocalypse riding across the land would be a gratifying sight for such alarmists. 'x°C' is always the worst-case scenario that has been produced by some extremely questionable computer model. Not a single one of this 'suite' of models has demonstrated any skill in predicting global temperatures. Not one. It is almost impossible to counteract effectively this torrent of information supporting CAGW. Hundreds of CAGW memes are circulating at any one time. In the average three minute TV slot with an uninformed moderator the sceptic has no chance, even if they are allowed to participate. NASA (man on the Moon) says that it is the hottest, wettest, driest etc. What can be said against that? Does the CAGW sceptic really believe that NASA (man on the Moon) is manipulating its results? Or that the Royal Society is issuing propaganda? (Well, yes and yes, since you ask). In one minute a skilled CAGW motormouth can make a dozen or more false statements to form an emotional oral 'word cloud'. Refuting any one of these statements takes a long time – time which the sceptic never gets. Certain stalwart bloggers such as Paul Homewood,Anthony Watts,Jo Nova and too many others to mention here, together with organizations such as GWPF fight the propaganda and misleading interpretations that circulate in the public sphere but the problems for individuals countering such a mass of authority through so many outlets are immense. Even when you demonstrate that some claim is not just wrong but completely idiotic it makes no difference. There will be no reponse, no consequence and the great bulldozer rumbles on. The responses that the CAGW panic has engendered, particularly in the field of energy supply, can only be described as deranged. Since the backs of fag-packets are so hard to come by these days our unit of refutation will have to be the Post-it™ note. One of these is sufficient to demolish the case for wind as a practical source of reliable energy. This is the case now and it was the case in the mid-nineties when the lunatics took over the asylum. One Post-it™ note is and was also sufficient for the case of solar energy, which, in northern latitudes can power a light bulb for an hour at noon on a cloudless 21 June every year. Unfortunately at night, when you need to switch on the light, solar is not there for you. Then we have one Post-it™ note for wave power, one for tidal power. There were therefore in the nineties four Post-it™ notes with a few scribbles on them that irrefutably showed that none of these technologies would ever achieve their energy goal. Despite that, the powers-that-be, crazed by terror of the four horsemen of global warming, went ahead. Interconnectors and huge 'smart grids': hey, if the UK is becalmed, it will probably be blowing a storm in Zagreb or Sicily or… somewhere. Batteries: the surplus energy produced can be stored and given out when required – trouble is, there is never enough surplus energy and even if there were, the batteries to store this amount of energy efficiently have not been invented. 'Smart meters' will allow boffins to manage demand and encourage energy saving. 'Managing demand' here means cutting off the electricity supply. 'Encouraging energy saving' means frightening consumers with the realtime cost of the energy they are using. Diesel backup generators can be used to top up any shortfall in the grid: just don't mention the carbon dioxide, the particulates, the nitrous oxides produced. Better make sure the hospital windows are tightly closed as well. Since the entire conventional generation of electricity has to be kept available to provide the base load and to supply the power not supplied by renewables, let's invent carbon capture and storage, CCS. We will only need just one more Post-it™ note to show that this technology – once it's been invented – is probably the most lunatic one of all. Oh, and just one final point: let's all use electric cars and trucks. That will really work well on an electricity grid that is about to collapse just trying to cover normal demand. The idea is so lunatic that we don't even need to use a Post-it™ note to refute it. Oh, and of course, don't mention anything about economics, costs, opportunity costs, strike prices and all that boring stuff: the survival of 'the planet' is at stake. And all this irrationality, driven by some dark terror of carbon dioxide and the CAGW it will cause, has ground on unstoppably for more than 20 years. Even after the release of the two 'Climategate' email collections, nothing happens. How much longer will it go on? I have no idea. One thing is sure: CAGW alarmism is not a victimless crime and when it eventually ends a few show trials to cheer us all up might certainly be in order – tastefully done, of course: the guilty the defendants before the court in rags, trousers without belts, that kind of thing. Perhaps preceded by some mild torture such as the sudden withdrawal of research grants or fieldwork in the mosquito swamps of Siberia (do mosquitos bite more frequently on Tuesdays? –that vexed question) or a few years in Antarctica watching the snow fall (does snow fall faster when you are only wearing your underwear? – so many questions, so little time to answer them!). Sceptics! Be ready. Be prepared. The downtrodden around the world are keeping lists and knitting. So, you think Mad Mitch deserves his name, you CAGW-ers, do you? What I find particularly significant is the statement from Prof David Mackay that this substantial commitment to solar energy was made in spite of the clear professional advice from the civil servants at the UK Department of Energy and Climate change that Solar Energy should never have been considered as useful and viable in the context of the UK environment (unfavourable timing, latitude and weather). 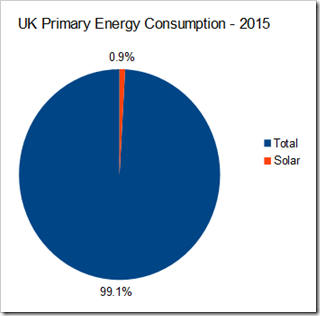 Whether we have really spent £28 billion on solar cannot be known. But we do know that the Committee on Climate Change have estimated the annual Renewable Obligation subsidy for solar at £307 million. In addition to this are Feed in Tariffs, for smaller installations, which cost a further £991 million a year. If we assume that solar accounts for 80% of FITs, we arrive at an annual subsidy of £1.1 billion. The CCC assume both ROs and FITs will run for 20 years, so we get a total subsidy of £22 billion, all to be paid for by consumers. The fact that ministers at DECC pursued such a policy against the clear professional advice of their civil servants, and on the basis of green ideology, is not only a disgrace, but an abuse of their authority. What does the UK get for this £22-28 billion? 0.9% of its electricity use. Those shell-shocked by the projected costs of the Hinkley Point nuclear power station should note that a greater amount will be spent on solar for an almost infinitesimally small output. Another Post-it™ note moment brought to us by Paul Homewood, this time apropos Hinkley Point C Power Station. Take a Post-it™ note. Write 'Electricity price 1016: £97.87/MWh'. Bad enough. But then just reflect that the forecast increase in the wholsale price for electricity to the year 2013 results almost entirely from the addition of a 'carbon price' of £19.50/MWh to the true production price, a tax by any other name which consumers will have to pay. The word 'lunacy' seems really quite mild to describe what our betters are doing here on behalf of their people. Yes, but we would not use car batteries; we would use bigger units, and more efficient and newer lithium-ion batteries. All right, let’s buy Tesla Powerwalls instead. We would need 160 million of them to cover a day’s consumption, or 3.3 billion to cover a week when we’ve electrified heat and transport too. They retail for $3,000, so that’s about £8 trillion. For a system that would only rarely be needed in full. Maybe we could get a discount. We mustn't overlook the losses caused by DC-AC conversion and grid synchronisation: AC to DC going into the battery, DC to AC coming out. It's not lossless.